Location-based services continue their hot streak when it comes to funding, as Ambient Industries has received an extension to their seed round to build out their application Flook. Alongside this news, Flook is gaining a number of new features to expand it location-based discovery elements. The extension of the funding from Amadeus Capital Partners and Eden Ventures totals close to $1 million, we’re told. This is on top of the undisclosed amount they raised from the same investors in late 2008. Flook is a location-based service that has both a web app and an iPhone app. It can probably best be described as a StumbleUpon for location-based discovery, as that’s pretty much how you use it. On the iPhone app, which launched a few weeks ago, users create “cards,” which contain a title, a picture, and a caption. You then tag the card in the correct category (“funny,” “art,” “food & drink,” etc) and when you upload it, Flook tags your location to it, so that others will find it. Users browse these cards on the main screen either by simply scrolling through cards near them or cards from people they follow on Flook. The cards you like the most, you can “collect” to view later. Twitter: Cards can easily be tweeted, either from the web, or from your phone by enabling settings for those who want to use flook to interact with their other social networks. APIs: APIs are in closed beta as we are still installing the nuts and bolts, but we encourage companies with interesting applications and integration plans to contact us at info@flook.it. Flickr Import: This is a really cool way to auto-generate flook cards from geolocated flickr photos. Just tag your photo with one of our keywords (for example, flookfunny to make a funny card), and your photo’s title becomes your flook card’s title, with its description becoming the caption. At the moment this functionality is limited to a few people we really like – people with great content on the web that they want to share with their followers, enabling them to find their content when they’re out and about. New Content Partners: One of the first of our new partners is Ghost Signs (http://flook.it/community/ghostsigns/). Now, if you’re out and about in London you’ll easily be able to track down Sam’s great content – and use the back of the flook card to start a discussion on it. The Ghost Signs cards are examples of hand painted advertising on walls which are part of a wider collection held within the History of Advertising Trust Ghostsigns Archive. The archive opens for business on 19th March 2010. Flook helps Sam get the word out. Collection & Following on the Web: Hey, this is cool! We’ve increased the synergy of flook and its web-based interface. Now when someone emails you a flook card, and you follow the link to the web, you can collect that card for later, or follow its creator. This is a great way to make a great collection of stuff to do when you’re out and about with your iPhone. Translation: When not exploring our local area, we are feeding our imaginations by looking at the cards that flookers make all around the world. We have brave flookers starting communities in places as diverse as Taiwan, India, China and Australia. Up until now, we’ve been able to admire the photos, but I haven’t had a clue what people were flooking on about. But now you can just tap the card to bring up the HUD and hit the translate button to turn “G’day mate, this dunny is cactus” to “Hello my good man, I’m afraid this lavatory is inoperative”. Although this feature is in its infancy (you can’t translate comments yet), we think it has great potential. Soon, we think you’ll all be exploring Darkest Peru and Outer Mongolia with flook, and getting fantastic tips for places to visit from the locals rather than the same old same old from an expat guidebook author who probably doesn’t even speak the language. We love widgets! Now, if you have your own website, but love to flook, you can invite your people to follow you on flook with a handy widget that you place on your site. Flook is an interesting way to find a variety of location-based information. It doesn’t emphasize the popular check-in model like Foursquare or Gowalla, or the game-heavy model like MyTown, and instead focuses on visual aspects. The new Flickr import ability seems like a great idea to extend this usage. Two of Ambient Industries founders, Roger Nolan and Jane Sales, are perhaps best known for their work at Psion, where they contributed the code that would eventually become the Symbian OS. 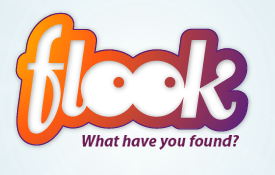 See more of Flook in the video below or find the free app in the App Store here.